From the first time I walked up to the gun bar at my local Academy Sports, I knew there was something special about the GLOCKs in the case. Oh, I tried all the "also ran" brands and all the big bad boy "all steel pistols". But when I placed the grip of a G-21 in my hand for the first time, I knew I had found something special. The gun was not flashy, but black, blocky and without pretense. There were no wasted buttons, bells or whistles. No sharp edges. The gun could best be described in one word as "earthy". My first purchase was a GLOCK 21 .45 ACP. And from there, my life changed as far as handguns went. While I frequent a couple of gun forums, as expected in a place where anybody gets to blow their opinions around, stupidity is rampant. With funny little **$$$##*** signs (to keep from violating forum rules), unsubstantiated statements, and ignorant commentary from people who many times have never owned or shot the firearms they criticize. Finding advice that is educated and helpful is sometimes challenging on forums. And on the forums, there are GLOCK lovers and haters - not much in between. People who don't like them usually blame something vague like "grip angle" or "terrible trigger" (though most couldn't shoot much better with a gun custom molded to their hand with a trigger pull that snaps like a saltine cracker). Forget that. Take it from somebody who owns and uses them even though they are not perfect.....sigh....... Before anybody writes me with all the scathing criticism that can be developed in the space of a tiny mind, don't bother. The guns have a colorful history, but once each model has been developed and the bugs worked out (like with any firearm) this is the true scoop on these handguns. Here is the reality about the most appreciated of guns in my life. One trigger pull = one shot, one extraction, one ejection, one feed, and if you did your job, one hit....over and over and over. They feed any type of factory ammo you can stuff into them and they do it without blinking. The trigger pull on these guns is consistent, relatively light and the same in all factory GLOCKs. 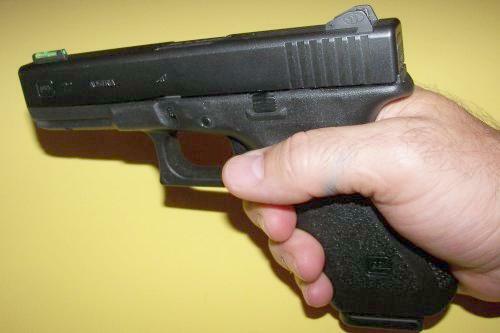 The guns will fit most hands, though the G21 .45 may be too large for people with small hands. My hands are average size and I shoot a G21 comfortably. However, I now own a G23 (40S&W) and a G17 (9mm) and prefer the .40 over other calibers. Nothing to do with the gun, just seem to shoot that caliber well. In any case, they all shoot the same, dependably. While other people are picking stuck casings out of their guns at the range, you can be putting bullets downrange over and over again without worry about failures. I love reading the delusional masses on the gun forums who buy a new pistol that had some problem feeding, extracting, firing, etc. and blame it on *(((**&&%^% ammo (the way they put it). Let's be clear about something here. If your gun does not feed, fire, extract and eject, there is something wrong with the gun! It is not the ammo. Any working firearm should function as expected out of the box (after cleaning) with any type of non coated factory ammo. If yours doesn't, don't be delusional. You got a defective firearm. Get it fixed or get rid of it. I'm going to make a statement here that will no doubt raise the ire of GLOCK haters. If you took all the production tactical handguns of all brands, all production materials, and lined them up side by side, used them all the same with the same ammo, day after day, month after month, after all the others are ready for the scrapheap the GLOCKs will still be going strong. Poor sentence structure and length, but true statement. GLOCKS are also comfortable to carry. I carry mine (duty size compact G23) all day long many days in summer clothing. No sharp edges gives the ability to wear one comfortably in an inside the waistband holster. While full size models can be carried this way, the compact models make even better carry choices for those who prefer them. And they still provide a full grip. Aftermarket parts for GLOCKS are abundant. Virtually every parts and accessories maker makes their products to fit GLOCK models. A GLOCK will work for decades as is with nothing added. They will serve you well as a recreational shooter, self defense handgun and even a competitive shooter in practical stock pistol competition. But, if you like guns like I do, and you get a GLOCK, you're probably going to want to add some cool stuff to it for your style of shooting. Note my customized G22 below with steel adjustable rear sight, high visibility tritium front sight, and Barstow stainless steel semi-drop in barrel. The gun is just amazing with these customizations, plus it adds some cool profile looks to it. I have much more commentary and information about GLOCKs in the GLOCK Reviews page. This page was just to state my position on these great guns. Like em or love em.....I love em. And what's cool is that if anybody thinks I'm wrong about everything on this page, they've got it to prove, not me. GLOCKs have long spoken for themselves in dependability, durability, and shootability. At this point in history, blanket criticism of these guns is sounding stupider and stupider all the time. Obligatory Disclaimer: The information on this page is the author's opinion and is not intended as or to replace information from the firearm manufacturer. Anyone stupid enough to do whatever I say here or anywhere else on this website without substantiating my writings with manufacturers and experts in any given field, do so at their own risk. If you buy a GLOCK, load it and stick it down your pants without proper training and a proper holster you will probably blow off whatever the barrel is pointed at. This disclaimer is not all inclusive and should be construed to cover anything ridiculous anyone might do from reading or misreading anything on this web site. UPDATE 2018: Yeah, it's been 11 years since my first GLOCK and I still own and carry one. 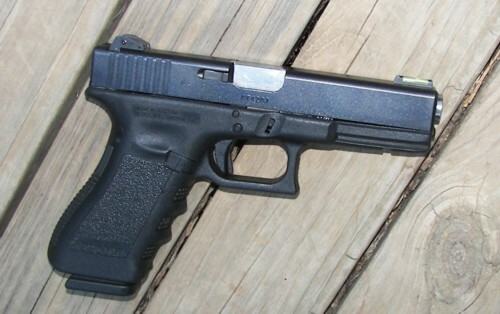 The G23. Still dependable. Still accurate. Still easy to carry. Do I actually "Love" them? No. I don't love any gun. But even though today I prefer some of other brands to shoot, I have no greater appreciation for any brand of firearm on the market than for GLOCKS.